Annie over at Blogdorf Goodman has organized her annual end of the year “ Best “ lists from fellow bloggers. I am happy to be here for my first year. Many of my favs are ones that I have reviewed in past posts, but at least you know I really do like/use what I talk about and review. The list tends to be fragrance heavy as well, but many good ones hits the stores this year. It is also not in any particular order. Feel free to weigh in with your “ Best Ofs “, and Happy New Year. Guerlain Iris Ganache- My favorite release of the year I think. Guerlain had some great releases, and this one I splurged on. Cool , crisp and ever so slightly gourmand. The ganache note is just the right touch of chocolate. Not heavy or cloying, but more pastry like. It blends with the chilled iris and lasts super long. Honorable mention goes to the company’s Spiriteuse Double Vanille, a stunning warm , smoky vanilla. I don’t normally go for vanilla, and the tobacco note is hard for me to like, but all together this is one winner. Couvent des Minimes Hand Cream- At last years after Christmas sale at Bath and Body Works I got a tube of this. I had already gotten the gift set for 2 people. The holiday scent was orange cinnamon so I had to have it. I love it,as did every gift recipient. I think it’s even better than the original L’Occitane which this seems to be a copy of. Really rich but not greasy, it sinks in, smells wonderful and really gets the job done. I have since gotten backups in the Honey Lemon scent. At the sale this year they are in the 75% off bin and sell for 1.10. Well worth it, and since I think they may be being discontinued, stock up while you can. Maybelline Superstay Silky Foundation- If someone had told me that I would try a Maybelline foundation, a non oil free one no less, and that it would turn out to be so good and make my skin look so perfected that people would tell me how good I looked, I would never have believed it. (Not that I have a bias against drugstore brands, I am a huge fan of L’Oreal Foundations). Maybelline has done some decent ones in the past but none have overwhelmed me until now. Superstay Silky is a base and foundation 2 part-er that comes out together. Sometimes I don’t even use the primer side, but either way my skin looks great, completely covered and not too heavily made up. Nioxin Shampoo- I never thought I needed a specialized shampoo. I have easy to deal with hair, but after trying this I was amazed at how much better my hair looked, styled and most of all held on to color. They tell you this line is made for colcor rentention, and I never knew what a difference there was until I used this. Even my hairdresser noted how long the color lasted compared to previous times. Mac Tendertones- MAC came out with a lot of goodies this year, and many are favs, but to pick one would be Tendertones. I have Purring, which has a just there orange tint, full of shine and some shimmer. Best of all they really moisturize. I love a good lip conditioner and these totally fit the bill. They have it all in one, and I think would be the only lip product you would need if, say, you found yourself in Aspen or Telluride, ready for skiing or sleighriding wrapped up in your shearling. Not that I’ll be there. Sounds good though, doesn’t it? . 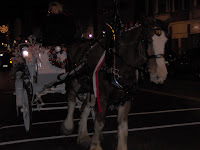 At least I do have a shearling and a sleigh. By Kilian- one of the best perfume lines launched recently. Some have been put off by the pretentious sounding PR copy on the website, but forget all that. Kilian Hennessey is totally unlike that in person. He is very nice, and super informed about all things perfume. His line of six scents is fun, unique, sophisticated and smells great. Beyond Love is my favorite, a creamy tuberose with a hint of animalic notes that are barely perceptible. Parfums MDCI- The best of the new releases, edging By Kilian just a bit. What a year to have 2 great French perfumes lines introduced and to have been fortunate to meet both Frenchman behind them. Claude Marchal is totally charming, and really wants people to love his perfume. His bottles are hand created works of art, and the fragrances within, worthy of the bottles. These say Tres Chic all the way. My favorite of the 3 is Rose de Siwa, I feel so elegant when wearing this. Estee Lauder Signature Lipstick- It isn’t always easy to put a new spin on lipstick. 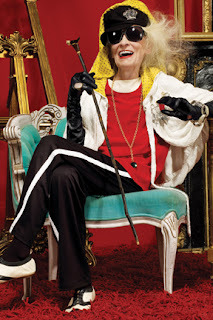 Estee Lauder this year did it well. The new lipsticks are full coverage, super creamy and come in a wide choice of colors. They also have a very old school pretty case that has some good weight in your hand. Everyone I know who has tried them loves them. 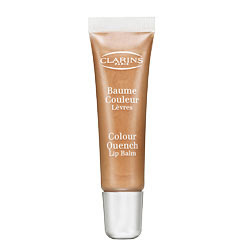 Clarins Color Quench Balm- Hands down the best moisture giving, color depositing gloss/balm. Not new, but it was to me, as I got with a gift card after Christmas last year. Loaded with shea butter, it is super soft and creamy on, and will keep your lips moist all day, all winter. The line is also rich color drenched. You can get pale shades, as well as reds, oranges, and nice neutral browns like mine. At last a lipgloss that does it all. The color lasts long, and it has a great fruity scent. Neil Morris’ Dark Season Perfume. This one makes it in under the gun, as I just got a sample this week. A winter comfort scent containing balsam fir needle, cinnamon, dark vanilla, myrrh and more. Inspired by a winter in Finland, with outdoors-y and indoors warm notes. Johnson & Johnson Soothing Naturals Soothe and Protect Balm- a convenient stick that can be used on lips, hands etc. Great for when you don't want to apply hand lotion all over i.e after you just did your nails. Clinique Zero Gravity Repairwear Lift Firming Cream- at last an anti-aging product that I can use all the time and not break out from as it comes in a version for combination oily-oily skin. I get the anti-aging benefits and some moisture but just a little. Perfect. It really does firm, and make the skin look good. My number 1 skin product right now. Here's the list of the fellow bloggers who are joining in giving us their Best Of Lists. Take a look and see what we all loved in beauty this year. Thanks Annie for putting this together . I think most of the perfume loving blogosphere is buzzing with the new Bond 9 Andy Warhol fragrance news. I am posting it as well in case you haven't seen it yet. I love the notes for this one, as Silver Factory wasn't really me. It will launch in March. With her latest Andy Warhol-inspired fragrance, Bond No. 9 founder Laurice Rahme is trying to turn niche marketing into an art form. Andy Warhol Union Square by Bond No. 9 is a floral fragrance with a musk and spicy twist. 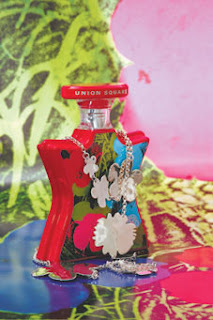 Created by Stephen Nilsen of Givaudan, Andy Warhol Union Square is composed of top notes of lily of the valley and green stem; middle notes of sweet blue freesia and white birch wood, and bottom notes of amber and silver-cloud musk accords. 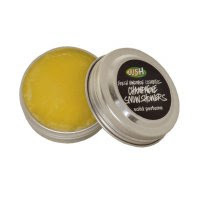 For Christmas I picked out Lush's Champagne Snow Showers solid perfume. A huge fan of solid fragrances I was looking forward to trying these. I knew I would love Champagne... and I did. What surprised me was that I really didn't like the others as well. Only Go Green might be a future buy. Champagne Snow Showers is supposed to be cognac and citrus. A good combination. The scent is mainly citrus, and there is a hint of a deeper note that would be the cognac. It's very orange-y and nice. 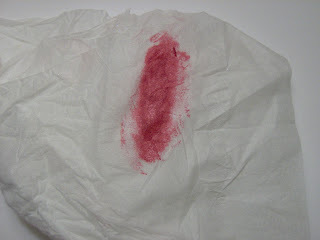 The fragrance solids are greasy as to blend well and they can even provide some moisture. I don't get a lot of sillage though, nor it is very long lasting. 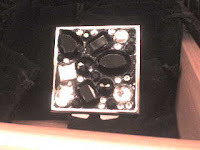 Solids, as the most concentrated perfume, usually are very strong and lasting. I know my Estee Lauder White Linen solid is a sillage monster and will last all day and more. The Lush solids are great for portability. They can be tossed in a purse or car or drawer and will not leak or break, so thats helpful. Champagne Snow Showers( currently sold out online) and all the other fragrances sell for 11.95 for the small tin. All sorts of lovely cards come in the mail before Christmas, and arriving on Christmas Eve was the most unique one I have ever gotten courtesy of Urban Decay. 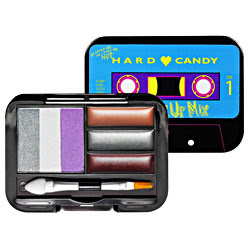 Totally fitting the Urban Decay aesthetic, it definitely gave all of us here a chuckle, and a wonder at just how naughty some might have been this year. 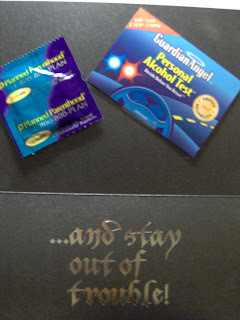 You see the card came complete with a condom and a personal alchohol test. So it was not just your ordinary greeting, but a potential care package as well. It's Christmas Eve and I want to wish everyone a Merry, Blessed Christmas filled with all the things you love, i.e. lipstick ,powder and eyeliner. 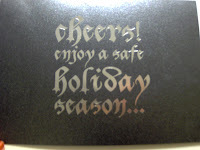 My first holiday as a blogger and I have enjoyed featuring gifts and holiday collections. 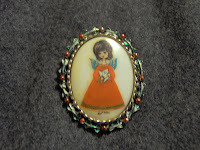 For this one, I have a picture of one of my favorite Christmas pins. My grandmother gave it to me when I was a kid, and I assume it was hers . It wasn't given as a gift, just as something she gave me. It's very heavy, and has no markings. I love how vintage it is, and I think it's probably the oldest of my holiday pins. Bobbi Brown's new Spring collection is called Pink Raspberry and will launch next month( although I have seen it some places already). The collection is a mix of neutrals and brighter pinks and includes a palette, glitter lip gloss, rouge pots, a lip sheer ,and my favorite of the collection- lip crayons. I love lip crayon type lipstick, and it's not alwasy easy to find them. Benefit made a good one , but I am not sure it's still out, and NARS are too matte for my taste. These are creamy, and last very long. They leave a nice stain behind too, after they have worn off some. A crayon gives you that perfect outline right off without liner. 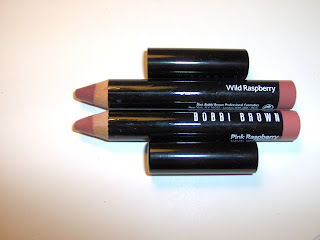 Both shades Pink Raspberry and Wild Raspberry are neutral pinks . The palette has two shadows, one a vanilla like shade, and a deeper grey. 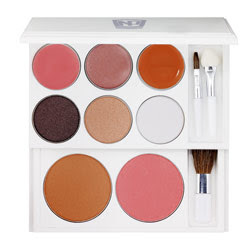 The pink blush is bright one , and would work great on darker skin, but was too much for me. Of course I didn't try lightening it up with powder , which would work too. It's very pretty though. Two pretty pink- brown neutral lipsheers round out the palette. It's a great all around to have in the bag. I love how glowy the model looks in the main picture. Ok, the Christmas packages haven't even been opened yet, and here come the early winter and spring collections. Next month Lancome releases on interesting new line called L.U.C.I. 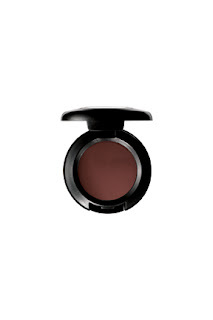 "LUCI stands for Luminous Colorless Color Intelligence and it’s the latest technology from the Lancôme laboratories. Gucci Westman, was captivated by the beauty of sand, the iridescence of shells and the play of light on water at different beaches around the world and turned to the labs to bring her inspiration to reality. Iridescent color, like that found on a butterfly’s wing or a bubble, is the result of an optical phenomenon where hues of a n object change color based on light interference and viewing angles. The formula of this makeup looks white to the eye, but when applied to the skin or on top of another product, it creates a spectacular transformation. Each of the colorless color particles acts as tiny light chambers, capturing and intensely refracting light for an iridescent finish. I had fun testing a few of the products. The favorite was the Color Fever Shine lipstick in the photonic shade Luminous. Totally white in the tube ,when applied it flashes like aurora borealis but with more pink . 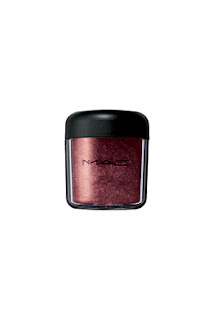 Lots of shimmer, and by itself is a really pretty color. It can also be blended over other lippies to tone them down, shimmer them up etc. The collection also includes a bright pink ( Desert Pink) lipstick , and the two combine well. 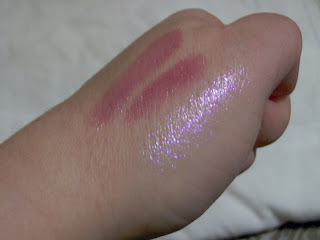 In my swatch picture from left to right is the two combined, the pink one alone, and the photonic one alone. The Color Fever Glosses come in 3 shades. I tried the pink one, which while bright pink in the tube goes on a bit more sheer, and the seashell color which is a barely there cream. 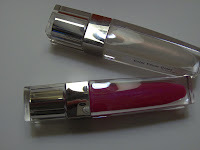 I have always loved the Color Fever glosses, I think they have great color payoff. The line also has Ombre Glacee a creamy iridescent highlight for eyes, that again looks white but has flashes of color when applied, and could work for cheeks as well. An eyeshadow duo that I didn't test but I love the look of since it contains a bronzey shade with a photonic one, a photonic eyeliner, and an illuminating powder brush rpund things out. Next up Thakoon lipstick called Pixel Pink. 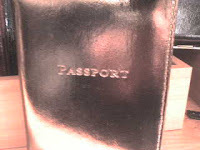 The last in the Pret a Porter line, this one looks like a real winner. Super raspberry in the sample, it goes on sheer and with a slight gloss. It ends up stain like and will be perfect for summer looks. My swatch is not on a hand this time, so the sheerness doesn't come thru, but the more neutral look of the shade does I think. Pixel Pink will come out in March. MAC Originals Collection hits stores tomorrow along with a contest to find a MAC Original. I have some of the originals in their old form, so will be fun to compare the new ones. Info on Contest below, and some pics of the collection. M·A·C Cosmetics announced the “Are You A M·A·C Original?” contest to launch their new limited edition collection The Originals. The contest is a celebration of one’s individuality and originality—qualities intrinsic to the M·A·C brand. Launching nationally through the M·A·C website (www.maccosmetics.com), the contest will also run regionally in 6 key cities across the United States: New York, Los Angeles, Miami, Las Vegas, San Francisco and Houston. 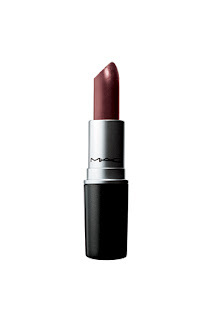 To enter the “Are You A M·A·C Original?” contest on a national level, consumers can visit www.maccosmetics.com beginning December 26th to submit a picture of themselves wearing their favorite M·A·C products, along with 50 words on what makes them a M·A·C Original. The winner will be determined by votes online. The winner will receive a $1,000 M·A·C gift card and the complete Originals collection. On a regional level, M·A·C will hold the “Are You A M·A·C Original” Contest in New York, Los Angeles, Miami, Las Vegas, San Francisco and Houston on the weekend of January 4th-6th. M·A·C customers can visit designated M·A·C locations for a complimentary makeup application and get a professional photograph taken. Customers can then enter to be the MAC Original winner of the city and will also be automatically entered into the national contest. 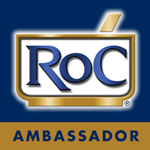 The regional winner will receive a $250 M·A·C gift card, the complete Originals collection and a story in a local publication. Macys is going 24 hours starting December 21 in certain locations including the huge Herald Square store in Manhattan. Now, I am not a big fan of this all night retailing, with stores open till midnight all the time and such. ( after all a dear friend had to be in Kohls by 2:30 AM on Black Friday to open the store at 4AM ,which is just crazy). However, at the holidays everyone needs a little extra shopping time, and in NY , the city of constant buzzing, it makes some sense. Throngs of tourists will love being able to go at any hour. Being able to go out at almost any time is part of New York City. The people who have to work it , well, thats a different story. Now the LL Bean suburban locations I have seen going 24 hours, no. Simply no. Seriously. Beginning 7 a.m. Friday, Dec. 21, seven Macy's stores, including the Herald Square flagship, will be open 24 hours daily until 6 p.m. on Christmas Eve. 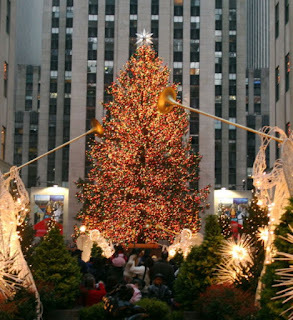 The other six stores are: Kings Plaza in Brooklyn, Cross County shopping center in Yonkers, the Staten Island mall on Staten Island, Roosevelt Field on Long Island, Newport Center in Jersey City and the Willowbrook mall in Wayne, N.J.
pic: Rockefeller Center tree- open 24 hours too. I spotted this cute Korres gift set awhile ago at Macys. I have not seen the line in Macys before, so maybe it's special for the holidays. It can also be found online at Korres.com. 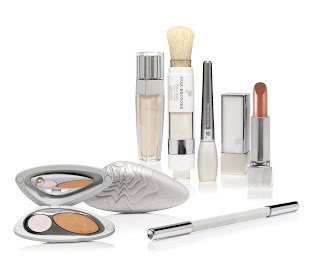 It's a great little set with a lot of products and a perfect gift for the beauty nut on your list. She may not have tried all these before, or would just love to have handy purse size versions.
" The kit includes mini versions of Korres Natural Products: for facial cleanliness and hydration there is Milk Proteins 3-in-1 Emulsion to remove makeup residue, cleanse, tone, and moisturize, Wild Rose 24-Hour Moisturizer, and Evening Primrose Eye Cream to help conceal dark circles. To rejuvenate the rest of the body, Guava Shower Gel invigorates the senses with a sweet scent while Guava Body Butter heals, softens, and nourishes the skin. Bonus: A pack of Lemon Refreshing Chewing Gum to boot." How odd is it that 2 magazines featured celebs wearing suspenders on the January issues? I hope this is not some new trend. Equally odd is that Victoria Beckham is more clothed than Keira Knightley, although perhaps not when one considers that she told the magazine that she simply can't keep her clothes on during a shoot. Personally I don't like the look on either of them . I also like Keira better in lighter hair, but her red lips rock. She says also,that she is in an old Hollywood look phase. Thats a good one to be in. Much better than say, Christina Aquilera's Dirrty Girl one. So I wonder how Ms. Beckham feels having another magazine cover with almost the same outfit as hers. This strikes me as something that would not go over well in Posh-land. Always on the lookout for new texturizing and working hair products, I wanted to try out the new line in hair salons from L'Oreal Professionnel, called Texture Expert. Made to achieve great styling for all hair types, there are products tailored to fine/limp, medium /thick ,and coarse /rebellious. For some reason I picked out some products for coarse/rebellious hair, thinking it would be good for keeping my hair in a certain style, but really I needed medium/thick. The Coarse ones have a bit more moisture than I normally look for and are perfect for very wiry, dry and frizzy hair. That said I was still able to use the products and and actually quite liked them. Obviously there can be crossover with types. I had just had my hair colored as well, so a bit more moisture is good. The first one I used was the Gelee Riche. A gel that is anti frizz and helps with either a smooth style or a disheveled one, adding moisture and flexible style. I used it on damp hair before drying in place of my leave in conditioner and instead of my usual Sebastian gel. I want something that gives great hold and style as I rarely do a lot of over styling to my hair . I was happy that my hair styled easily and looked great, and there was no over moisturized feeling. I even felt that I needed my leave in conditioner, and then to use this as a styling agent. I did that next time, and my hair came out great. The Gelee Riche gives hair great workable style , and will stay in the rotation. Next up, for maintaining some style, and tweaking my hair when needed was the Lumi Controle polish. This is slightly shimmery cream that is adds a good bit of moisture to hair, and aides in piecy styling or smoothing hair down. This one is from the medium/thick line. It did a good job on making the pieces of hair I wanted to define stand out, and it held pretty well. It's more moisture than I need most days, but I like it all the same. It also has a great coconut smell. I also am using the Fluid Intense Smoothing serum for the pieces that stick up and need smoothed down. I can see this working well for those who need smoothing and straightening in a big way. This has a good bit of moisture in it. Heres a comment from uber hairstylist Recine who worked with L'oreal on the new line, and some photos of the October 29th launch party with models styled by him. “L’Oréal Professionnel’s new Texture Expert line arrives at a time when hairstylists need more transforming products thanever. I’ve been using Texture Expert Smooth Velours to give hair a silky, smooth and healthy look. Sometimes I’ll use a lot of the product to give this incredible wet look that stays wet looking without drying up on photo shoots. I also love using Expansion, a mousse that gives fine hair strength and vitality that really impresses clients. 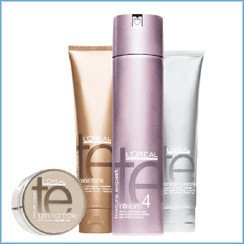 All L’Oréal Professionnel Texture Expert products have amazing transforming qualities." "This gift set is beautifully packaged in an octagonal fit box and finished with a stylish seasonal ribbon. Includes: 3.4 oz Cranberry Wrapped Soap, 0.3 oz Cranberry Lip Balm, 2.0 fl oz Cranberry Shimmer Lotion and a 2.0 fl oz Cranberry Body Butter." Nice pajamas are almost always a great gift, and super soft , lounging ones, even better. One of my closest friends, who works retail and has no time to shop, has already bought herself 2 sets of these on the rare day we had to go to a Macys . They are currently on sale online for 20.99 , and should be in stores as well. ( Plus there is always a Macys coupon ). They come in many pastel shades, and petites as well. Evening type bags are another great gift. This is one thing I think people don't buy for themselves as much, but love to get, as it's frivolous but useful. This one from Calvin Klein is really an anytime bag. It can be evening or day. It also comes in a herringbone pattern. 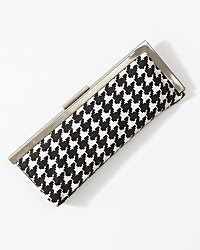 Guess also has some great evening bags at Macys. Retailing around 50.00. 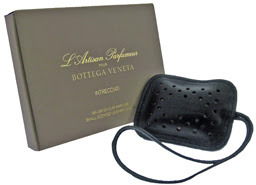 For the real frivolous gift, there is this Bottega Venetta designed for L' Artisan Parfumuer Leather Sachet. Bottega bags are pretty pricey, so instead you can have this little sachet for 70.00. A truly unique gift and rather cool. "Intreccio No.1 magically recreates the atmosphere of an old library inside a Venetian palazzo. The sweetness of polished wood is folded around supple leather, conjuring the moment when one sinks into a large armchair and inhales the rich aroma of book bindings and burning candles. A transparent touch of somber incense lends an exotic feel to this alluring and evocative fragrance"
at http://www.aedes.com/, and free shipping until Dec. 14 with code- Holiday. 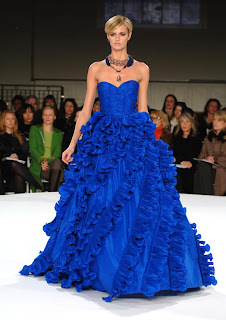 Oscar De La Renta staged a pre -fall 2008 preview show earlier this week. Several beautiful jewel toned gowns went down the runway. I could do without the ruffles on the blue one, but otherwise they are typical perfect Oscar. Perhaps we will see some of these come awards show season? I had my eye ( no pun intended) on this eye stick for awhile, finally getting it a Christmas gift last year. It was hard to find in my area, and it ended up being at Ulta. I loved the cooling idea, as who doesn't get weary eyes, plus the ease of use. The stick really does have a cool feeling , and it glides right on to the area . Just swipe on eyes, cap it and you're done. No sticking fingers into pots, tapping, etc. I don't find it overly moisturizing, and is isn't really supposed to be. More for refreshing the eyes, and puffiness and circles. Luckily I don't have too much of that to deal with, so I can't say how well it would work on those concerns.What I can say is that it does stay on the eyes for awhile, absorbing in. The website for Vichy lists 2 mineral type ingredients that help the eye area. The rest of the ingredients on my box were all chemcials mostly, which I didn't like, but really I love this little product. It's easy when you are very tired, or your eyes have just had enough for the day or night. It does firm a bit, and add some moisture, so thats good enough for me. I do use a heavier cream on the eyes most of the time, and sub with this as I want to. I also find this good for those mornings when the eyes need a pickup. The ultra fresh formula offers the unique association of 2 ingredients, Manganese and Escinine, to revitalize skin radiance and reduce the appearance of under-eye bags. The eye contour area is instantly revitalized and radiant. The eye contour appears refreshed and rested. After one week of use, the appearance of under-eye bags is reduced and dark circles appear faded. I look forward each year to the Holiday release of The Cranberry line from the Body Shop. The smell is simply one of the best. When I saw that a reed diffuser had been added for this year, I was anxious to try it. Anything that would keep that Cranberry scent going all the time, unlike a candle. I do have the scented oil, but even that needs refreshed often. A diffuser would work all the time. I have had it up and out for a week now, and have not flipped the reeds. I can still get a good whiff of the Cranberry. It was really strong at first and lovely. The set comes with a good size jar of oil, a square glass container to hold oil and reeds. There is enough there to last quite awhile. The whole house smells of this, as the scent really wafts everywhere. I haven't done much with diffusers in the past, so I am glad I tried this, and I think I need to stock up on more, since it's a seasonal item. I also keep thinking of more people who would love this for a gift. ( This is the perfect hostess gift , by the way). The Body Shop has a large line of Cranberry scented products, and also new this year is hand lotion and hand soap which are also big on the " to try " list . The Diffuser is 22.00 and available at stores , online and through the Body Shop at Home. Origins Friend and Famliy sale is going on now. Save 25 % , plus free shipping through Dec. 5. Some great items are the Salt gift set shown at 29. 50, or something from the Cocoa line, or Spring Fever , the wonderful, bright fragrance. 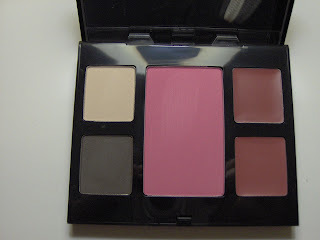 On a recent Sephora visit, they told me it was time for my birthday gift as a beauty insider. It wasn't my actual birthday time, but the computer had it listed as such. The gift was a large travel size of Bliss Naked Body Butter. I had never tried the Bliss butters before, and wow was it great. Now I know, I am a beauty blogger, how could I not have tried one of the more popular moisturizers out there. Well one main reason is that they still have parabens in them. Yes I use plenty of makeup that must have them, but I ,for the last several years ,have tried very hard to buy lotions that have no parabens. They are out there, good ones too like the Pacifica butters I reviewed awhile back. Drugstore brand wise Curel only in the Ultra Healing version doesn't have them. Unfortunately many great brands do have them, and I do read labels. So thats why Bliss hasn't made it into my lotion use yet. Back to the butter. I knew the Bliss stuff had to be good, most of their products are, but I was really impressed how quickly this sunk in, no greasiness left at all and it really did moisturize into the next day. I actually liked that it was unscented. It truly has no scent, and sometimes that can be a nice change. It doesn't compete with other scents, or doesn't bother you if you don't need any scent around sometimes. I remember smelling the Plum one some time back and loving it, so I am now thinking should I get it ?? Plus the new Snow Wonder sounds good too. Bliss- lose those parabens and you're mine. Bliss Body Butter available at sephora stores and online, Bliss ,http://www.blissworld.com/and department stores. It's not even December yet, and it seems like so many people have their lights up already and more. It's enough to make you feel behind before the month starts, but don't. There is lots of time, and Christmas and the shopping for it should be a fun time. Try and enjoy it. There is a great piece in the December Vogue written by a woman who wanted to do all her shopping at once in a nice store, so she went to the Saks flagship in NY. It's all decorated up and everything is in one place. You may not have a Saks budget, but department stores area great place to shop. Festive and with a wide selection, you can go in and get a lot done at one time. The Limited also had several really nice clutch purses incl. a heavy metal one that was more a minaudiere. Some pretty earrings and necklaces round out the items. One of my favorite fragrances this year is finally more readily available. 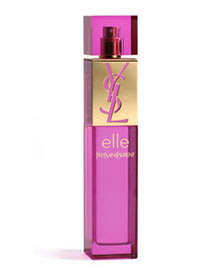 YSL Elle is now not only on the YSL beaute site, but at Neiman Marcus, just in time for holiday giving and receiving. "Unpredictable and unique, Elle is the essence of femininity which embodies Yves Saint Laurent. A vibrantly feminine, audacious fragrance that blends dazzling floral and woody notes." 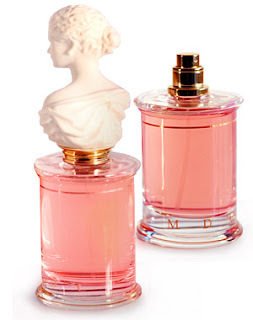 Top Notes: Cedrat, peony, lychee.• Middle Notes: Pink berries, freesia, jasmine.• Bottom Notes: Patchouli, vetiver, ambrette. The eau de parfum is available in two sizes, a l.6 oz. and a 3. oz. elle Yves Saint Laurent Eau de Parfum, 1.6 ounces. elle Yves Saint Laurent Eau de Parfum, 3.0 ounces. I have always wanted to do a holiday gift guide and now I can. I plan to try to cover all price ranges. I like to think I am a great gift giver, not only do I love it, but I pay attention always to the things people point out as liking. I also am not afraid to ask someone what they would like for Christmas. It's a sure way of getting them something they really want. So some guidelines- don't be afraid to ask what someone would like, and don't be afraid to tell them that it's cool if it isn't what they want to return it. Enclose a gift receipt if you can. This way you need never know if they returned it. Hopefully you'll give a great gift, and lets face it, a gift of beauty almost always works, so you're in the right place. Many times I also have helped people ( sometimes total strangers in a store) pick out something for someone else. I would love to be a personal shopper, so I am opening up the comments for you to state your gift challenges,and I will try and help. It doesn't have to be beauty/fashion related, but that would most in keeping with our theme. When the Penhaligons catalog arrived , well I wanted lots of stuff from it, but also I immediately saw this shower gel set and thought what a great gift. You get six 50 ML shower gels including Lily of the valley and Lavandula. Penhaligons is great quality , and it comes in a nice gift box. $ 55.00.